North Korea’s foreign minister said on Monday that President Donald Trump had declared war on North Korea and that Pyongyang reserved the right to take countermeasures, including shooting down U.S. bombers even if they are not in its air space, as Reuters reports . President Tayyip Erdogan warned on Monday that Turkey could cut off the pipeline that carries oil from northern Iraq to the outside world, intensifying pressure on the Kurdish autonomous region over its independence referendum, as Reuters reports. Germany’s Angela Merkel was reelected chancellor for a fourth consecutive time, but as Deutsche Welle reports, the rise of the far-right AfD and losses for two major parties in Germany’s election may have shaken up the country’s political landscape in a dramatic fashion. And, as the WSJ’s William Boston reports, German business leaders on Monday warned that the rise of a nationalist anti-immigration party could hurt the nation’s export-driven economy. Prime Minister Shinzo Abe has called a snap general election that will decide whether Japan sustains its massive economic stimulus and shape the country’s future until the 2020 Tokyo Olympic Games and beyond, as FT’s Robin Harding and Peter Wells report. The chances of nuclear war with North Korea, according to Admiral James Stavridis (USN Ret. ), dean of the Fletcher School of Law and Diplomacy at Tufts University. Source: LA Times. — CSIS’s Jeff Rathke via Deutsche Welle. Today our Kremlin Playbook podcast was featured on Apple Podcasts. You can download, subscribe, and listen to the first episode here. (Photo credit: Amir Levy/Getty Images.) 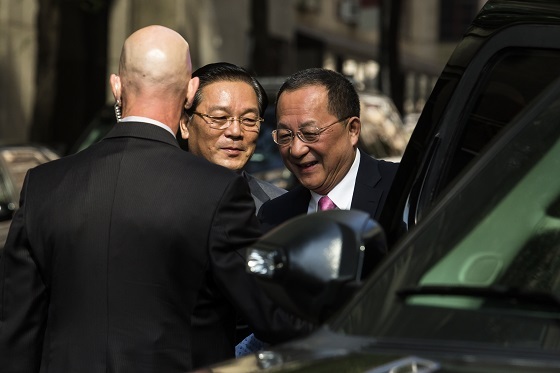 North Korea’s foreign minister, Ri Yong-Ho, departs after speaking to reporters at the UN Millennium Plaza hotel today in New York City. “Congressional aides risk conflicts with stock trades,” a Politico investigation by Maggie Severns. At 9:00 a.m., attend the latest of the “Careers in Global Development” series, this time featuring Michael Hess, who has held positions in the U.S. military, private and public sectors, and the U.S. government. Join the CSIS Scholl Chair in International Business at 10:00 a.m. for a morning conference on humanitarian licensing, a new concept in IP regulation that seeks to improve access to new innovation in humanitarian contexts. At 11:00 a.m., the Philippine secretary of foreign affairs, Alan Peter Cayetano, will speak at CSIS as part of the CSIS-Pertamina Banyan Tree Leadership Forum. At 2:00 p.m., the CSIS Europe Program will host Edward Luce, Washington columnist for the Financial Times , to discuss the rise of populism in Europe. The CSIS Project on Military and Diplomatic History will host “ Presidential Role Models: FDR, Truman, and Reagan ” with Walter Russell Mead of the Hudson Institute at 4:30 p.m.
And, join us at 5:00 p.m. for a Schieffer Series discussion on the threat of North Korea, hosted by Bob Schieffer. Today, Kang Kyung-wha, minister of foreign affairs of the Republic of Korea, gave a speech at CSIS on ROK-U.S. relations and the North Korean nuclear issue. On Friday, the CSIS Podcast released “Germany goes to the Wahllokale,” a new episode on the implications of Germany’s parliamentary elections. Thanks for all of the great emails on “Rock is not dead.” Judging by the response, rock is very much alive! If you ask Dave Grohl and his band the Foo Fighters, there is no question—rock is life itself for these guys. Grohl, is of course Nirvana’s former drummer and has studied rock and roll almost as much as he has added to its cannon. His series for HBO “Sonic Highways” is fantastic. His directorial debut, the documentary “Sound City,” about the history of an Los Angeles recording studio, is not to be missed. And neither is this excellent cover of AC/DC’s “Let There Be Rock” recorded for BBC’s Live Lounge. What a smile!